Sophie always said, “Tennis is my racket.” SGHY brought New York Junior Tennis and Learning (NYJTL), the NYJTL coaches and their program to the South Bronx as well as the Lower East Side, this year. 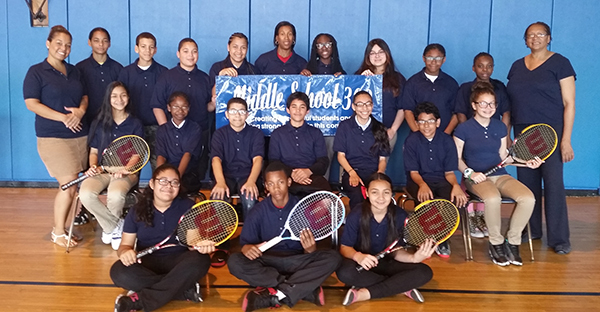 Working with these Middle School’s teachers, NYJTL conducted after school tennis programs during the Spring semester. What did the students have to say? Without the tennis program I wouldn’t be able to learn how to play tennis. What I learned from tennis is that you can’t be standing still, if you stand still you are most likely going to miss the ball. Thank you! I never knew anything about tennis. Now it is my favorite sport. I play with my dad now and I am teaching him everything that I learned. I loved the tennis matches that we had at Columbia University and the food It was a lot of fun. I can’t wait until next spring when we can go practice again. Thanks. Tagged Healthy Youth, MS 126, MS 302, New York Junior Tennis and Learning, NYJTL, Tennis.